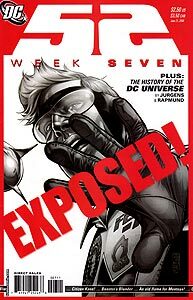 Cover Description: Booster Gold holds his hand up, as though trying to block a camera from taking his picture. Skeets (erroneously depicted as Skeets I instead of Skeets II) floats in the background. Brief Synopsis: The personal lives of several heroes take a turn for the worse. Issue Notes: Booster Gold's false villain is revealed to Metropolis. "Week 7, Day 3." A conversation between Booster Gold and the actor that Booster has hired to play the role of the villain Manthrax is interrupted by Ralph Dibny, formerly Booster's Justice League companion as the Elongated Man. Skeets II refuses to answer the door or provide Dibny with a drink, insisting that he has "no hands," a poor excuse for a valet model robot. PRODUCT PLACEMENT: Patches for Booster's costume are visible on a table in Booster's penthouse presentment. Companies pictured include Cadmus, Ferris Aircraft, LexOil, Lit Beer, Progene Tech, and Soder-Cola. Both Ferris Aircraft and Lexcorp, parent company of LexOil, were sponsors of the Conglomerate during Booster's tenure as leader. Beside the patches is a swath of unidentifiable blue, purple, red, white, and yellow fabric. Dibny accuses Booster of failing to warn him about his wife's death. Booster is unable to acceptably defend himself against Dibny's charges. This is far from the first time that Booster has been unable to defend himself against charges that he doesn't share his knowledge of the past to the mutual benefit of the hero community, preferring instead to act on that knowledge selfishly. 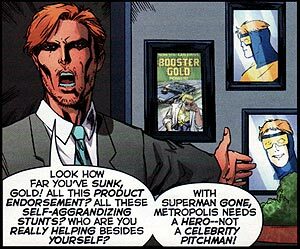 PRODUCT PLACEMENT: On the wall in Booster's penthouse are several pictures of Booster Gold, including the cover of Booster Gold #11 which advertises the Boostermobile. PRODUCT PLACEMENT: Taking the opportunity provided by Booster's shattering of a water main to put out a propane fire, Skeets pitches the "official Booster Gold Windproof Umbrella," possibly a product of the Booster Gear line of apparel. On a small scale, water should not be used to extinguish propane gas fires. However, using the force of a water main break to wash out a propane gas tanker truck is a novel and likely effective solution for preventing a full-scale explosion of the stored gas. MEET THE PRESS: Booster stops to talk to Lois Lane, star reporter for the Daily Planet newspaper. Booster pauses, acting as though he cannot remember the reporter's name. This is a bit of a running gag that Booster has used before, as Lois Lane has interviewed Booster more often than any other reporter. At last count they have met five times previously, discarding large gatherings both have attended (such as funerals for Superman and Sue Dibny, as well as the gathering of heroes in 52 Week One). Bob Castell, the actor who Booster hired to play Manthrax, interrupts the interview between Booster Gold and Lois Lane in order to reveal that Booster hired him to fake an attack for Booster's self-promotion. Apparently, Booster's check to Castell bounced, forcing the actor to reveal the stunt for revenge against Booster. Booster should have suspected that the actor was no good when he flipped-flopped on his real name, previously telling Booster that it was Bill, not Bob (in 52 Week Six), the name that he now provides for Lois Lane. In any event, even though Booster has always been an especially poor manager of money and a bad judge of character, this is a stunning failure even for him. How could someone manage money so poorly so as to sabotage his own schemes? MEET THE PRESS: After Castell makes his public accusation against Booster Gold, television reporters on the scene Gary McCraw and Ami Soon immediately jump on the story, accepting Castel's story and hounding Booster. And so Booster's slide from glory begins. Dibny takes the opportunity to publicly blame Booster for failing to prevent the death of Blue Beetle II. This unfair (and untrue) criticism is publicly damning for Booster, and is no doubt motivated by Dibny's conviction that Booster failed to aid him in saving his wife. Though Booster Gold and the Elongated Man have been friends in the past, it is this sort of behavior that could mark the end of their relationship. PRODUCT PLACEMENT: As the media abandons Booster for the story provided by Dibny, a new patch can be seen on Booster's back for Sundoller Coffee, a reference to the omnipresent Starbucks Coffee corporation. Boosterrific Review: Ralph Dibny, the former Elongated Man, encounters Booster Gold to express his frustration over the loss of his wife. This is the second old friend that Booster has angered in the past two months. Unfortunately for Booster, he wasn't that popular to begin with. Worse, Dibny exposes Booster's recent fraud to the Metropolis press, completely destroying Booster's renaissance. This issue is schadenfreude at its finest.